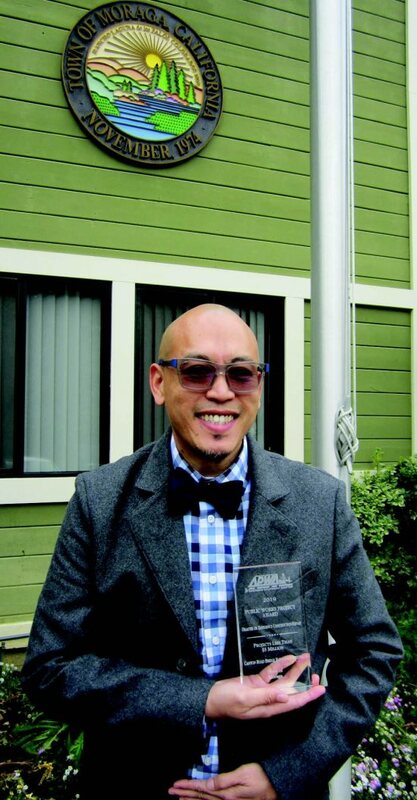 The Northern California Chapter of the American Public Works Association has bestowed a high honor upon Public Works Director Edric Kwan and his team. The 2019 award was in the category of Disaster or Emergency Construction/Repair for Projects Less Than $5 million. His team's quick response and strategy regarding the Canyon Road Bridge emergency opening did not go unnoticed by Norcal APWA. According to APWA's website, the institution was chartered in 1937 and is the "largest and oldest organization of its kind in the world with over 28,000 members. The Association currently consists of 67 Chapters throughout North America of which the Northern California Chapter is one." Included in the Norcal Chapter (formed in 1947 and was the first Chapter west of the Mississippi) are 11 counties: San Francisco, Alameda, Contra Costa, Marin, Solano, Napa, Sonoma, Lake, Mendocino, Humboldt and Del Norte. Kwan said, "I was surprised, because we thought we were entered in the Small City Category, but we were competing in the Big City Category against Richmond." The judging was done by teams of different consultants and contractors. The actual award ceremony was held on Feb. 21 in the City of Alameda's Albert H. Dewitt Officers O'Club. Kwan is quick to give credit where it's due. "The town council provided instruction to staff to reopen the access and we outsourced additional consultants and contractors. Our Senior Civil Engineer Shawn Knapp served as project manager. It was an unplanned project and a lot of unknowns were presented to us." It all began back in April 2017, when the town was notified that a storm-triggered landslide had damaged the Canyon Road Bridge resulting in its immediate closure. Issuing proclamations of local emergencies, Moraga received funding assistance from the Federal Highway Administration Emergency Relief Program. Of utmost importance was community safety. Follow-up inspections and tests had revealed additional landslide issues confirming that the only immediate solution was to install a temporary one-lane bridge, while planning for the construction of a new permanent two-lane bridge. Before a temporary bridge could become operational, the Moraga-Orinda Fire District established a relationship with the Oakland Fire Department to assist with any emergencies in the Community of Canyon. While the temporary bridge was being installed, an onsite safety officer monitored daily worker conduct, and a 6-foot-tall chain link fence was installed around the job site to prevent the public from entering and causing personal injury. The project included environmental awareness practices, all the while being cognizant of the need for a timely installation. The town reached out to environmental permitting agencies in order to meet essential parameters. The East Bay Municipal Utility District-owned Moraga Creek, which pumps water into the San Lorenzo Reservoir downstream of the bridge, meant that the town had to not only account for a design in the event of a normal hundred-year flood, but an additional 100,000 gallons per day of EBMUD pumped water. The work zone was considered an Environmentally Sensitive Area and silt fencing was installed to prevent wildlife from venturing into the work area. The Canyon Road Bridge was quite a work horse. Built in 1936, its constructors probably never imagined that one day its daily traffic count would amount to 6,000 vehicles along with significant numbers of bicyclists and pedestrians. With these statistics it was clear that the road through Canyon into Alameda County was not just for joyriding purposes, but a means of job-commuting. According to Kwan, "I always have a lot of contingencies in place when approaching a problem. It was key for us to be a cohesive team and organized in a uniform partnership to all be on the same page. We came up with the goods, and did what we needed to do to expedite the process." The town even had to fight a Temporary Restraining Order and a Preliminary Injunction by a member of the Canyon School Board claiming that the original Canyon Bridge was not really damaged and that the town was not qualified to close the bridge. 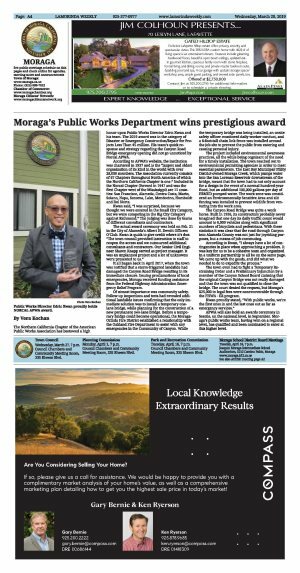 The court denied the request, but Moraga's $25,000 in legal fees were nonrecoverable through the FHWA - ER program. Kwan proudly stated, "With public works, we're the first ones in and the last ones out as far as emergency services." APWA will also hold an awards ceremony in Seattle, on the national level, in September. Moraga's public works team, having won on a regional level, has qualified and been nominated to enter at this higher level.